Confident-looking Dhaka Dynamites will be looking forward to keep their winning momentum intact as they take on title aspirants Comilla Victorians in the final of Bangladesh Premier League (BPL) at Sher-e-Bangla National Cricket Stadium on Friday. 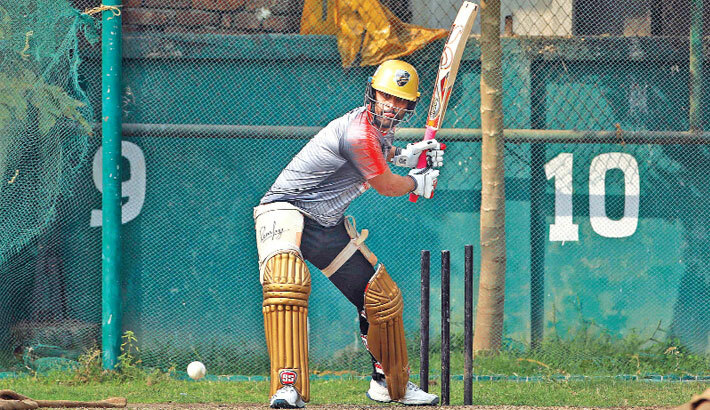 Victorians had a pretty consistent run during the group phase of BPL as they were placed second behind defending champions Rangpur Riders after completing the run on the back of four losses and went into the final by beating Riders in the opening qualifier. On the other hand Dynamites looked to be slipped into oblivion which was beyond comprehension as they lost five matches on a trot before winning their last match against bottom placed Khulna Titans to equal with Rajshahi Kings in the points table and only went into the last four on the virtue of a better run-rate despite having a star studded squad under their possession. But as it happens mostly, big players shine on big occasions and for Dynamites their four all-rounders Shakib Al Hasan, Andre Russel, Sunil Narine and Kieron Pollard wanted to make sure they don’t lose the opportunity of taking a last shot at the title by ruthlessly crushing defending champions Rangpur Riders in the second qualifier to book their berth in the final. In the process the four all-rounders of Dynamites came into the fore front before the final though Victorians skipper Imrul Kayes was reluctant to lose his sleep over them. Rather he looked optimistic regarding their chances in the final considering they have beaten them twice in the group phase as they did it despite the presence of the four leading T20 specialist. “We have beaten them twice in the group-phase despite the presence of those four all-rounders so we are not formulating any extra strategy regarding them,” Imrul told reporters ahead of the final. “Diverse situations arise in the field and we need to make our decision taking that into consideration,” he said. “More than anything else it will be battle of nerves and we need to keep our head cool because there will be lot of excitement going around our heads playing in the final,” said Imrul. “We also spoke regarding this in our team meeting and we are looking forward to execute those plans in the middle,” he said. However, Victorians head coach Mohammad Salahuddin remained guarded against complacency when it comes to taking those all-rounders into consideration. Pollard, the world’s most capped T20 cricketer and the third highest all-time run-scorer, has won 12 trophies including four IPLs, a Champions League with Mumbai Indians, as well as a BPL and a CPL title. Russell’s seven trophies include two World T20 titles, two CPLs, a BBL, a PSL and also a BPL title. In 2016 alone, he was part of five trophy-winning sides. Narine has won eight trophies that include the World T20 title, two IPLs and two CPLs. Shakib has been part of a champion side on six occasions, including twice in the IPL for Kolkata Knight Riders and twice in the BPL for Dhaka. “It is okay that none of our players drew attention individually but we have a great team spirit which was the most important thing for our team,” he said. Dynamites coach Khaled Mahmud emphasised on team spirit more than anything else on the whole as he believes four all-rounders won’t change the course of the game. “We need to perform as a unit if we want to win and certainly we are aware they are ahead of us psychologically by beating us twice in the group phase,” he said. “We are confident because we came back from a difficult situation and we hope to continue like the way we did in the last two matches,” he concluded.